Les Paul is an American Master. Period. For decades, Paul has been known as “one of the music industry’s greatest minds, having created one of the industry’s most well-known and respected guitar lines. He also was responsible for recording tech that has become the standard across the board. On June 18, 2006, a concert was held — fittingly — at the Gibson Amphitheatre to pay tribute to Les Paul and his legacy. Originally aired on AXS TV this past June, the concert was released on DVD early this past September via MVD Entertainment Group. While it is an enjoyable experience overall, it is not a perfect recording. The concert itself , which features some very well-known Les Paul devotees, sits at the center of the recording and is both a positive and a negative in the program’s overall presentation. Another notable negative to the presentation here is a total lack of a program guide. That will be discussed later. The segmentation of the concert and interview segments is its own positive to this presentation. Each element is, in its own right, important to the recording’s whole. All things considered, A Tribute To Les Paul: Live From Universal Studios Hollywood proves to be an unsuspectingly entertaining program. 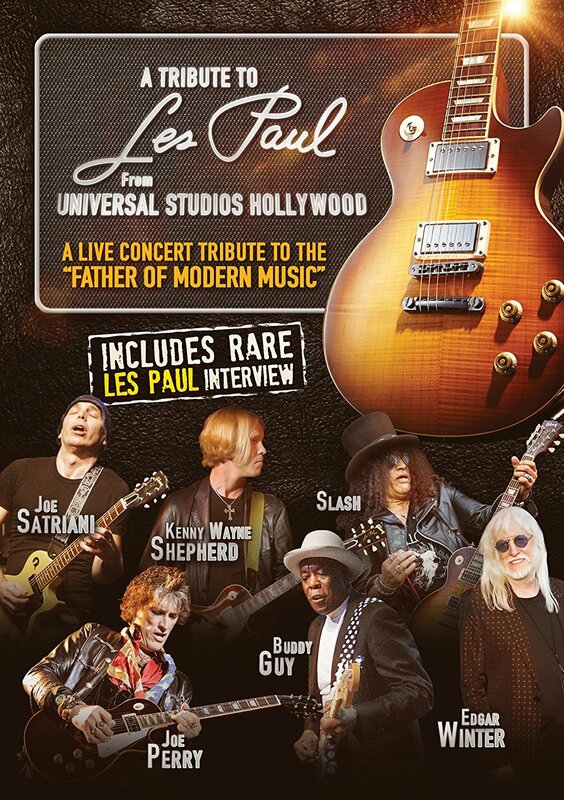 MVD Entertainment’s recently released A Tribute To Les Paul: Live From Universal Studios Hollywood, is a program that, while entertaining, leaves something to be desired in the end. That is due in part to its set list. Coming in at 93 minutes, the concert’s lineup features performances from some very well-known and respected guitarists including Joe Satriani, Slash (Guns N’ Roses, Slash’s Snakepit), Steve Lukather (Toto) Neal Schonn (Journey), Kenny Wayne Shepherd (Kenny Wayne Shepherd Band), Buddy Guy and others. Even famed front man Edgar Winter (The Edgar Winter Group) came along for the ride along with Joe Perry (Aerosmith). Many of the songs performed throughout the concert are covers, though Satriani did perform a pair of his own works in the form of ‘Satch Boogie’ and ‘House Full of Bullets.’ The covers included takes on Stevie Wonder’s ‘Superstition,’ Willie Dixon’s ‘Hoochie Coochie Man,’ which was first made famous by Muddy Waters, Johnny Winter And’s ‘Rock and Roll Hoochie Koo’ among others. Between these and other songs featured throughout the concert, and the artists tapped to perform them, audiences get in the performance, a dual music history lesson for all intents and purpose. They see veteran performers taking on some equally well-known songs, some of which are their own and some of which are covers. Considering all of this, the very setup for the concert serves as a positive for this recording. At the same time, being that the concert is only 93 minutes long and considering Les Paul’s legacy, it is surprising that more stars were not tapped for the concert. That lack of more performers (and in turn songs) actually detracts from the recording to a certain point, leaving audiences wanting more, but not in a good way. This sadly is not the recording’s only negative. The lack of a program guide hurts the recording’s presentation to a point, too. Audiences will note in examining the recording’s packaging that nowhere inside or outside the box is a program guide to be found. It is listed on the program’s main menu, but nowhere else. As has been noted so many times before about similar products, it would be nice to have that piece of the proverbial puzzle as it serves not only as a guide, but as a marketing tool that can serve to increase potential viewers’ chances of purchasing the program. By not having that guide included either in physical or printed form, MVD Entertainment Group has only hurt itself here. It really is a critical piece of the whole, even as much as it might not seem like it is. It is in reality, its own companion to the actual concert, which ties in a handful of interview segments with the featured artists. That segmentation, by the way, rounds out the recording’s most important elements. Segmenting the concert footage in this recording with the companion interview footage was truly a smart move here considering how little actual performance footage was actually included in its presentation. Without the interview segments, the program’s run time might have only run about half of that 93-minute run time, ultimately making it a failure. Luckily, those behind the program knew well enough to add in the interview footage, which itself adds its own insight to the program while also breaking up the concert and keeping audiences engaged. Audiences will be interested to learn through the interview segments that Les Paul was the person responsible for initially developing the 8-track recording machine (I.E. multi-track recording). Audiences also learn through Slash’s interview segment how much his appreciation for Paul grew as he himself grew. Joe Satriani also offers a funny anecdotes about being pranked by Les Paul at one point in his segment. Theirs are not the only interesting interview segments. Edgar Winters adds his own interesting thoughts in his interview, too. All things considered here, the segmentation of the program’s concert and interview segment proves a critical part of its overall presentation. When it is coupled with the recording’s very concert footage, the two elements make A Tribute To Les Paul: Live From Universal Studios Hollywood worth at least one watch. This entry was posted in Celebrities, Concerts, DvD's and blu-rays, Internet, Movies, Music and tagged AXS TV, celebrities, entertainment, facebook, internet, Les Paul, music, MVD Entertainment Group, MVDVisual, Phil's Picks, Twitter, Universal Studios, Universal Studios Hollywood, Wordpress by philspicks. Bookmark the permalink.